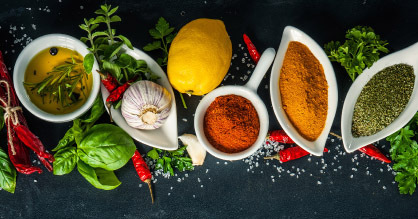 With spice and herb combinations that meld hot and sweet with tangy and savory, Mediterranean and/or Middle Eastern cooking boasts a wide array of flavors and aromas. Different countries are known for their own traditional spice mixes and marinades, each presenting wonderful ways to wake up your menu. Coriander: the tan seed of the cilantro plant, coriander has a subtly sweet, lemony flavor. It is native to southern Europe, North Africa, and southwestern Asia. The spice is typically available ground, but for a more intense flavor and aroma, toast whole coriander seeds lightly in a dry skillet before grinding them or adding them whole to dishes. Coriander is a classic addition to Middle Eastern seafood and vegetable recipes; try it in fish stew, falafel, or lentil soup. Cumin: the spice’s distinctive, earthy flavor is unmistakable in many Middle Eastern staple dishes. Use the ground version, or toast the whole seeds until fragrant before adding to dishes or grinding them. Cumin adds zip to fish and shellfish dishes and to couscous, marinades, and hummus. Paprika: made from the ground fruit of a red pepper plant that originated in Central America, paprika can range from mild to fiery. Sweet smoked paprika and hot smoked paprika are both dried slowly over a wood fire for several weeks, which imparts a delicious smoky flavor. Use it in iconic Middle Eastern favorites like baba ghanoush, fava bean soup, and lamb shawarma. Turmeric: vivid, golden-orange turmeric comes from a member of the ginger family that’s native to southwest India, and has been used in cooking since 600 B.C. Use ground turmeric to add a slightly pungent bitter flavor to rice, Middle Eastern-style meatballs, and to dishes starring chicken, lamb, or shrimp.